The truth is that I’d still prefer you to come and test ride stuff here at the shop, and let us work with you getting it all kitted out. But sometimes that just won’t work out. Some people just hate to drive, and if you aren’t used to it Austin traffic can be overwhelming. Sometimes you don’t have a suitable vehicle to transport what you are buying, or maybe you just don’t want to drive 4 hours in that beat up old pickup. And we’ve got this spiffy van now. And We want to Make Cycling Easy for you, so we’ll deliver. We will deliver up to 300 miles from Austin, and we will give one free hour of time getting you fitted, riding with you to take you through your paces, and instructing you on features and maintenance. We’ll spend additional time with you for $60 per hour, if needed. We’ll consider traveling longer distances, but we’d be hitting you up for a motel room and a meal. We can bring some parts and accessories for you to look at, and we can install them at our usual service rates. Service work is not included in the 1 free hour. Of course we can’t bring everything, and it would be best if you could be settled on just what you want before we hit the road. If you don’t quite know what you want we can bring up to two additional trike or bike models. See more about that below. We can work out what schedule works best for you, but the farther we need to go then the more planning we’ll need. Don’t expect next day service on a 200 mile run. We need to consider our schedule as well. This depends on both distance and how much we are delivering. These are introductory prices and may be revised once this program starts. The basic formula is a $20 service fee plus $1 per outbound mile up to 200 miles. We will reduce the mileage by 2% of the dollar value of your order. So, a $3000 (before tax) order gets you 60 free miles. If you live within 60 miles of Austin then you’ll pay the $20 service fee and that is all. If you live 100 miles from us then you’ll pay $20 + $40 = $60 for the delivery. That still gets you 1 hour of set up and practice time. For distances from 201-300 miles, the miles over 200 are at $2 per mile. Should we allow for a delivery over 300 miles you’ll pay the $2/mile cost and we’ll charge a $50 fee. If you don’t quite know what you want we can bring up to two additional models, but there is a $50 fee per extra trike brought. It will take more time for you to test out several models so you’ll probably have to pay extra fitting time. 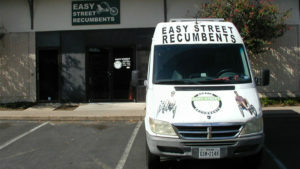 All delivery sales are paid for at our Austin shop. Austin sales tax must apply to all orders unless you have a sales tax. Contact us with your card info. We will run your card for the delivery charges based off our calculation of distance. We will retain your card info until the delivery is done in case there are additional charged for time or items added to your order.